This video shows the process I have used in past years to grind the V onto to angle iron to make V-Rails for my new CNC design. 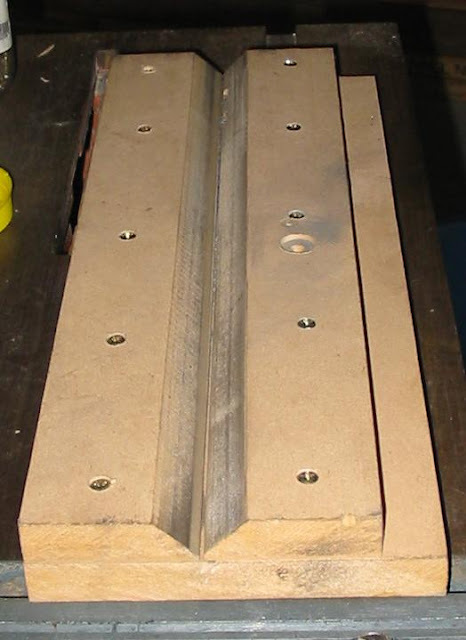 It uses a very simple jig, a small grinding wheel and the drillpress to put the V on the rail. It may not be everyones cup of tea but I find it simple to do and it gives me good results. It consists of a small grinding wheel and a few offcuts of MFD. I first cut a base out of MDF about 12" x 6"
I then cut another piece 7" x 12" which I then cut down the center to give 2 piece 3.5" x 12"
Screw one of these permanently down to the base and the other is screw into one of 2 positions depending on which side of the angle iron you are grinding. Alternatively use the method shown it the video and you will not have to change the jig to do the 2nd side of the angle iron. The Grinding is done with a small 2 1/2" x 1/2" grindstone attached to a drill press. The photos tell the story so I won't whitter on about it. 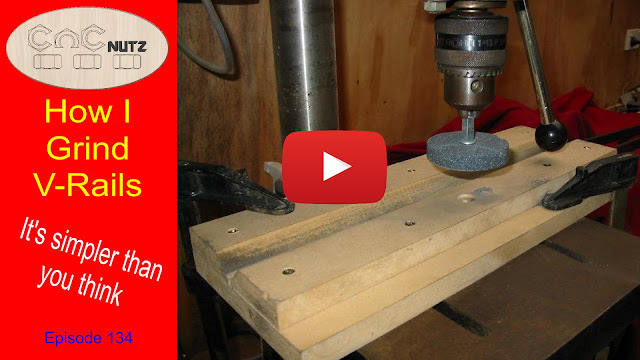 Set drill press speed to about 300RPM The faster you got the more heat you generate. 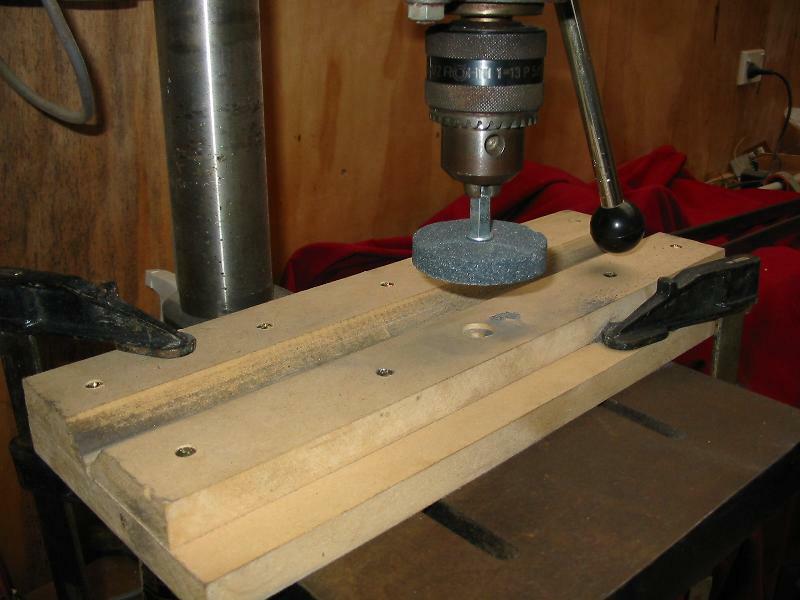 Set Jig on drill press table and ensure no more than 1/2" of of the stone covers the angle iron when cutting. 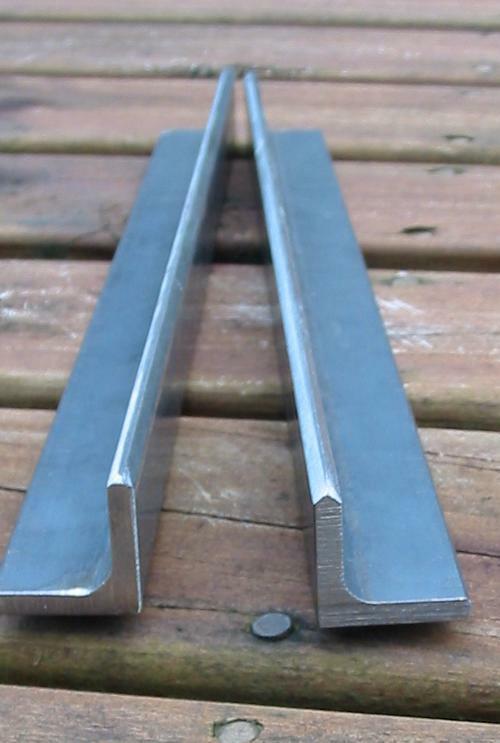 Put angle iron in jig and set height if grind wheel to the required height but only make small cuts. Push angle iron into the wheel and hang on. The wheel will drag the steel through the jig so wear gloves. The steel does not need to be held down but apply downward pressure on it anyway just to make sure. Did I mention Hold on to the steel. The wider the area is the more it will pull the steel through. You will not be able to feed the steel backward against the rotation of the grind wheel. Make many small cuts not one big one. The cuts are very fast 4 foot in about 30 seconds. HOLD ON TO THE STEEL. I hope you find this process useful. It would pay to practice on a small piece angle iron first to get the hang of how to do it before moving on to longer pieces.